I have always had a weird fascination with the "out of the ordinary." A ballerina in the middle of a train station; one single small cloud in the middle of a bright blue sky; and my personal favorite, school at night. Walking down the dark halls, where the familiar becomes out of place, appeals to me so much. Somehow it both calms and energizes me at the same time. 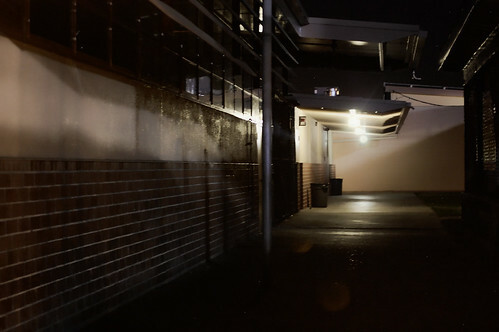 Last month, late one evening, I was walking back to my car from a high school football game. This hall jumped out at me on my right and I took a walk down memory lane. I can see why it appealed to you. I love the lines!